We all know Destin is home to some of the most beautiful beaches in the world but local state parks and nature trails are sure to please the nature lover of the family. From hiking, kayaking, fishing, paddling board and yes! even horse back riding – there is plenty of opportunity to explore more than the white sand beaches. Most parks are just a short drive from Summerspell 205. Don’t forget to pack a picnic lunch and plenty of water! I have listed a few from our partner site www.visitsouthwalton.com. Please visit the site for more information. Three miles of white-sand beaches bordered by dunes over 25-feet tall. With rare coastal dune lakes, camping and picnic areas, this park is recognized as one of the nation’s outstanding parks. RV spaces have full hook-up, swimming pool and laundry. Camping sites and cabins also available. Tram service available to the beach. Point Washington has three trail systems which are located 1/2 mile S. of 98 on 395 and a horse trail N. of 98 on Bay Dr.
Cassine Trail is located within the Point Washington State Forest and connecting to the Eastern Lake Trail, Cassine Trail offers a variety of terrain and showcases the diversity of Northwest Florida’s ecosystems. The trail is accessed through a rustic camping site in Point Washington State Forest and connects to the 30A corridor, through a Seagrove neighborhood (no parking). Explore this trail year round and take in the scenery at the turnaround point that offers a view of the headwaters of one of South Walton’s rare coastal dune lakes. This is also the connector to other legs of the Eastern Lake Trail System. The northern portion of Alys Beach is devoted to a 20-acre nature preserve that provides a quiet and reflective getaway. The trail winds its way through the preserve, with most of it on an elevated wooden boardwalk that gives a great view of the varied habitats below. 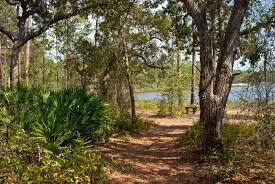 While on the trail, look for slash pines, cypress trees, open meadows, wiregrass and wildflowers. Be sure to look for the carnivorous pitcher plants – their tubelike leaf structure captures and digests insects, giving the plants added nitrogen in this nutrient-poor environment.